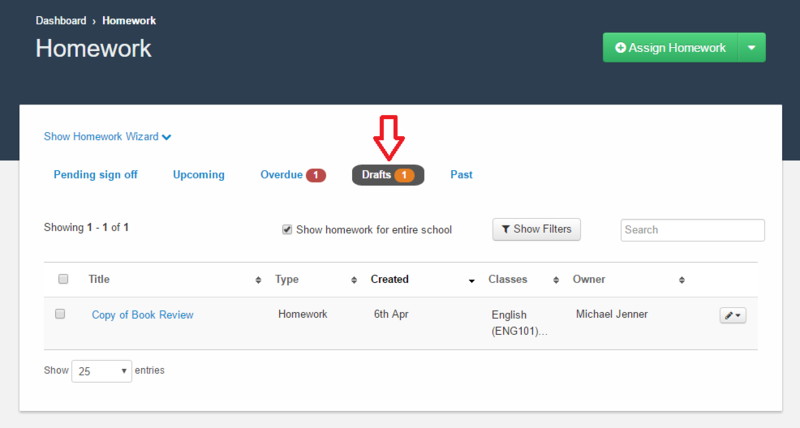 MyEDiary provides staff and administrators the ability to create new homework based on any previously created homework. This can save lots of time when having to repeatedly assign very similar homework to various students or classes. Step 3. In the popup window that appears, choose which settings from the existing homework you'd like to copy over. It will be automatically populated with 'Copy of [the existing homework title]'. You can change as required but it is advisable to use unique title names if possible. Selecting this option will copy over the actual homework content. Selecting this option will copy over the homework type, teacher sign-off setting, weighting, and estimated hours & minutes. Selecting this option will copy over the due date. Note that this will be the case even if the existing homework's due date is in the past. Step 3. 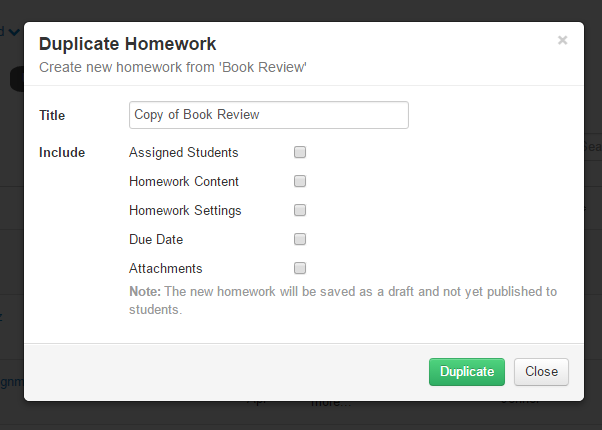 Click on Duplicate to create new homework based on the settings that you have entered above. The homework will be created in draft mode. Click on the 'Drafts' tab in the homework screen to view it. Step 4. Edit the task to finish populating the homework with the required data then click the 'Assign now' button to assign it to your class(es).